Two hikes this weekend, on Friday and Saturday, yielded looks at the Potomac River in two contrasting states: one open and unfettered, at Occoquan Bay National Wildlife Refuge, and the other partially shut in and put to work, at Riley’s Lock at the mouth of Seneca Creek. Occoquan Bay National Wildlife Refuge is located about 20 miles south of Washington DC, where the Potomac and Occoquan Rivers converge. Its 644 acres feature a mix of wooded grassland and marshland, home to a wide variety of wildlife, including bald eagles, ospreys, and a variety of waterfowl. We followed a 5-mile route that traced more or less a figure-eight through the refuge, giving a view of the entire shoreline east of Marumsco Creek. 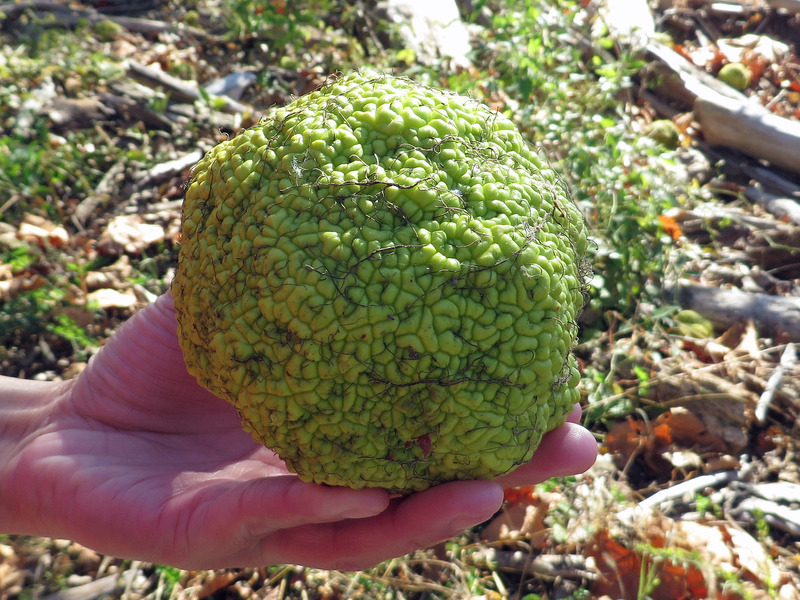 One of the interesting sights along the shoreline was Osage orange trees (Maclura pomifera). They’re very common in Oklahoma and Texas, where I grew up, so I recognized them immediately and was surprised to find them here. But a few grow on nearby River Farm in Alexandria, supposedly a gift from Thomas Jefferson. It’s my guess that over time, oranges floated downstream and took root here. The other interesting sight was turkey vultures. Turkey vultures are often seen in the area, especially in the Shenandoah Mountains, and look so graceful from a distance, gliding through the sky. Up close, having a little quality time with the chicks, it’s a different story altogether! Saturday morning’s outing was a look at the Potomac put to work, providing transportation. From 1821 to 1924 the C&O Canal, fed by the Potomac, enabled canal boats to carry cargo from Cumberland, Maryland, all the way to Washington DC. At Riley’s Lock you can see both the C&O Canal and Seneca Aqueduct, one of the eleven aqueducts built along the canal, so canal boats could cross over the streams that flow into the Potomac. Nearby Seneca Quarry supplied not only the stone to build the lock and aqueduct, but also the red sandstone used to build the Smithsonian Institute and several other buildings in Washington DC, notably some of the mansions around Dupont Circle. From Riley’s Lock, our 5-mile route took us downstream to Violette’s Lock, returned, and then walked upstream to a point across from Sharpshin Island and back, before walking up to Seneca Quarry to snoop around a little. It’s interesting to note the one span of the Seneca Acqueduct that was damaged due to flooding in 1971 and temporarily repaired with steel beams. In 2012 the C&O Canal Trust finished repairs to the towpath upstream at Big Slackwater near Williamsport, a project costing over $19 million to complete. While repairs to the Big Slackwater section were sorely needed, especially due to safety concerns, it seems a shame they couldn’t use some of the resources and the same contract instrument to effect permanent repairs here, since the temporary patch has been in place now for 42 years. In summary, 10 miles, two days, and two very different views of the Potomac River. This entry was posted in Hiking, Photography and tagged C&O Canal, nature, Occoquan Bay National Wildlife Refuge, Osage Orange, outdoors, Potomac River, Riley's Lock, Seneca Acqueduct, Seneca Quarry, Thomas Jefferson, turkey vulture, Washington DC, wildlife. Bookmark the permalink. Such history should be preserved. The photos show a wonderful scenic vista. I agree, within the realities of fiscal constraints. I suppose there is no great urgency, since the steel girders will probably last another couple of generations. There are other restoration projects, such as rescuing the USS Olympia, that simply cannot wait. The Olympia, Dewey’s flagship at the 1898 Battle of Manila Bay, is the oldest steel US warship afloat. If something is not done to rescue her within the next few years, her hull will be rusted completely through and she will have to be scrapped.